In Temporary Worker Rides a Subway, Mark Wallace presents two long poem sequences that explore and question contemporary language surround money and work. Using a widely varied set of poetic forms, Wallace creates a poetry of comic outrange to highlight the inconsistencies and absurdities in contemporary notions about the degree to which money and work provide reasonable measures of the value of people's lives. 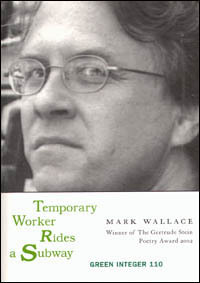 This book, the winner of the 2002 Gertrude Stein Poetry Award, reveals Wallace's interest in showing poetry as a way of responding to the kinds of language that attempt to turn human beings into productive resources at the cost of their self-respect and autonomy. Among his numerous other books are Complications Standing in a Circle, Every Day Is Most of My Time, The Lawless Man, Sonnets of a Penny a Liner, The Big Lie, and Haze.